Having chosen to publish anonymously during her lifetime, Jane Austen is enjoying extraordinary fame and fortune today as a best-selling author. In recent years, Jane Austen has enjoyed a resurgence in popularity-her books have been made into films,real box-office powerhouses, and gorgeous television mini-series starring some of the most notable actors of the day; she´s a darling of book clubs, and her beloved books even star as protagonists in new novels such as the best-selling book, The Jane Austen Book Club. 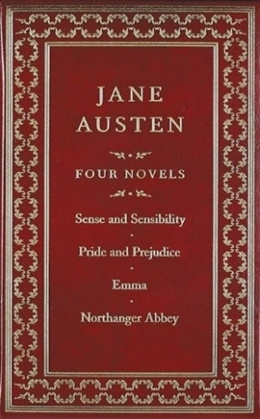 Canterbury Classics is proud to present Jane Austen, an elegantly bound collection of four of her best-loved novels: Sense and Sensibility, Pride and Prejudice, Emma, and Northanger Abbey. Bound in supple leather with padded covers, gold foil stamping, and pretty gilded edges, Jane Austen is an essential book for fans of English literature around the world.